I will carry out all your antenatal visits, attend to you during labour (including travelling with you to the hospital if necessary) and provide all your post-natal care to suit you, usually in your home. I charge £3,300 for all of the care I provide during and after your pregnancy. The whole amount is usually payable one month before your due date. My first visit is arranged to discuss your circumstances, needs and wishes. If you decide to book with me, all your antenatal visits are arranged at a time, place and frequency to suit you, usually in your own home. I can carry out all necessary checks and blood tests and can arrange for scans, either NHS or privately. I will discuss you and your partner's plans, concerns and questions about pregnancy, give you advice on how to prepare for birth and how to care for a baby, and I will help you to establish breast-feeding if you would like me to. I carry my mobile and pager everywhere so I can be contacted at any time, and I am on call 24 hours a day for when you go into labour. I stay with you throughout the labour and birth and leave once you and your new baby are comfortably settled. I carry a full range of equipment, including oxygen and resuscitation equipment. 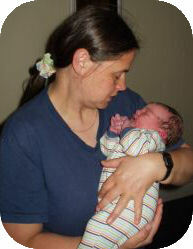 I have links with other midwives in the area if a second midwife is needed. Most of my clients book for home birth. However, if you wish or if circumstances dictate that hospital birth would be preferable, I can usually stay with you as a birth companion. "Sarah has attended hundreds of births and she had total faith in my ability to bive birth to my baby naturally. The birth was calm and relaxed and very different to my previous hospital births"
"Sarah has the perfect balance of a sound knowledge of midiwifery and a deep commitment to supporting us on our own particular journey"